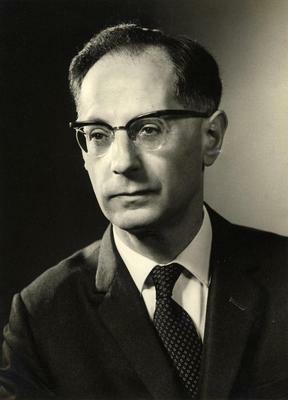 David Daiches Raphael (1916-2015) was Lecturer in Moral Philosophy from 1949 to 1951 and Senior Lecturer from 1951 to 1960. He was the first Edward Caird Professor of Political and Social Philosophy, from 1960 to 1970. A prize winning Oxford graduate, in 1949 he joined William Maclagan's Department of Moral Philosophy after war work in the Ministry of Labour and National Service and three years at the University of Otago. His earliest work here included teaching on the criminal science course and publishing a considerable body of work dealing mainly with moral theory. He left Glasgow in 1970, firstly for a chair in Reading and later moving to Imperial College London. Professor Raphael has held numerous academic and government appointments both in the UK and overseas. He is currently Professor Emeritus of Politics at the University of London.